This is the first time I've ever attempted this technique and let me tell you straight away - it is 10 times easier than I thought it would be and didn't take nearly as long as I thought it would! I've broken it down into 8 simple steps and I'll be uploading a video of my process to my YouTube channel, so be sure to check that out. I hope you like this, I'll be doing more nail tutorials using this technique in the future for sure! Preparation: Fill a cup (mine is a plastic disposable drinking cup) with ROOM TEMPERATURE* water. or let it sit out until it is room temperature. On clean and dry nails, paint a base coat to protect your nails, once dry paint nails white so the pattern is more vivid. Step One: With your selected nail polishes, drip one colour in the centre of the cup and allow it to spread out (don't be afraid if the colour fades dramatically or if it doesn't reach the rim of the cup) with your next colour drop colour in the centre of the previous colour, doing this until satisfied - You've now created the 'bullseye' affect. to the edge of the cup. Step Two: Taking a toothpick or skewer drag the outside edged and connect them to the edge of the cup - this technique is called 'anchoring' it sticks the polish to the cup so it doesn't move about so much when you're swirling the polish around. Step Three: Swirl and make your pattern with the toothpick or skewer. Don't press too hard into the polish. 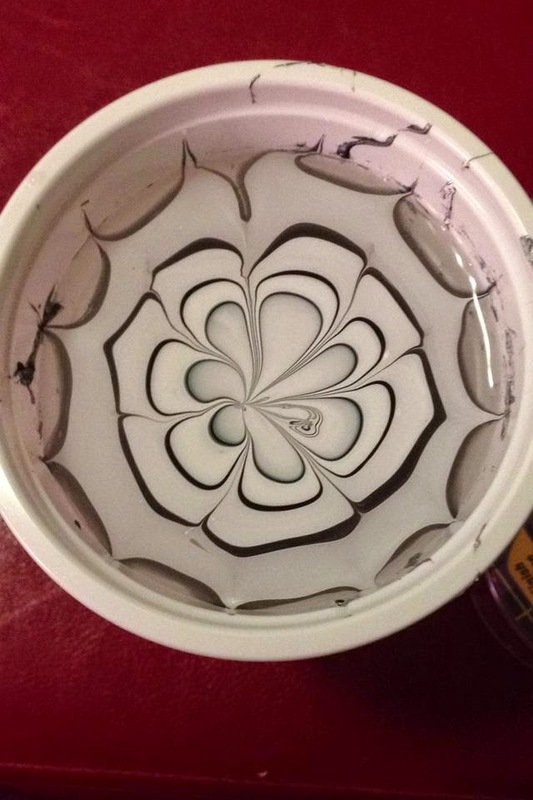 Gently drag the stick through the polish to make the desired pattern. I wasn't going for any real look, I was just having fun. Step Four: Once you've got your pattern how you want it, decide where you'll place your fingers, if need be turn the cup carefully to get a better angle. Step Five: With a cotton tip in one hand at the ready, carefully submerge your fingers making sure your nails touch the polish first. Don't remove them right away just keep them in the water. Step Six: With the cotton tip, swirl it around the remaining polish in the cup, wiping it all up and making sure the water is then clear from residue. This is so when you take our your fingers, the residue won't stick to the nails and ruin the pattern. Only once the water is free from excess polish should you remove your fingers. Step Seven: Use nail polish remover to clean up the polish on the skin. For a quicker clean up process, place sticky tape on the finger, framing the nail, so all you have to do is remove the tape and the skin is clean and only requires a little nail polish remover. Step Eight: Once fingers are clean and polish is dry, secure with a clear top coat and you're done! It really is very simple and I hope you try this out. If you do be sure to let me see your recreations by tagging me in it on Instagram or posting it to my Facebook Page. * The reason it needs to be room temperature is because if the water is too cold, the polish will set too quick. It will not work either if the water is too hot. This is a super cute tutorial! 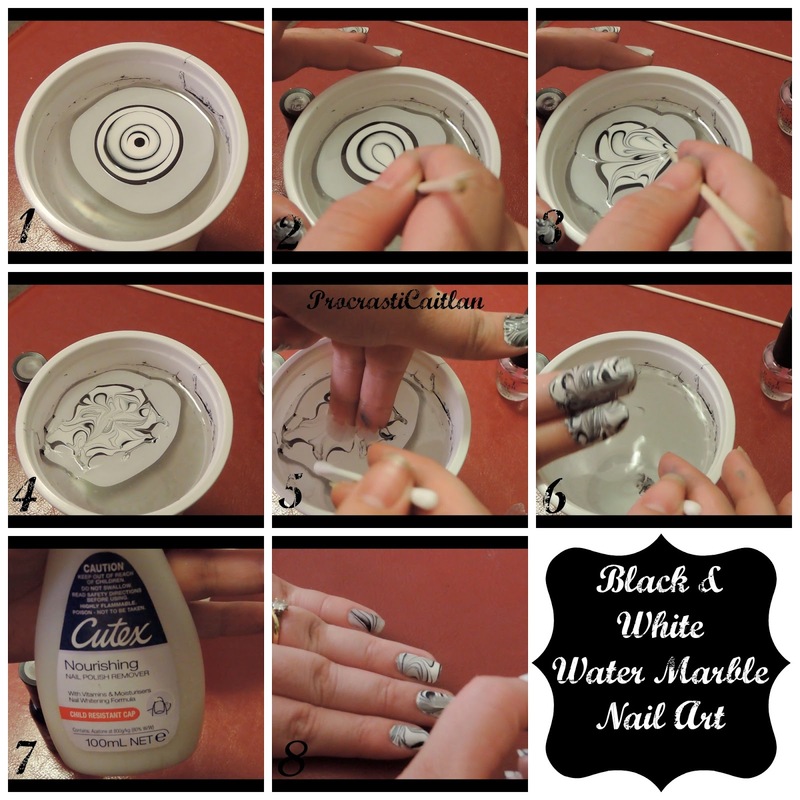 My sister loves doing nail art so I will be definitely showing her this tutorial! Check out mine? & join my Facebok Beauty Bloggers Group? 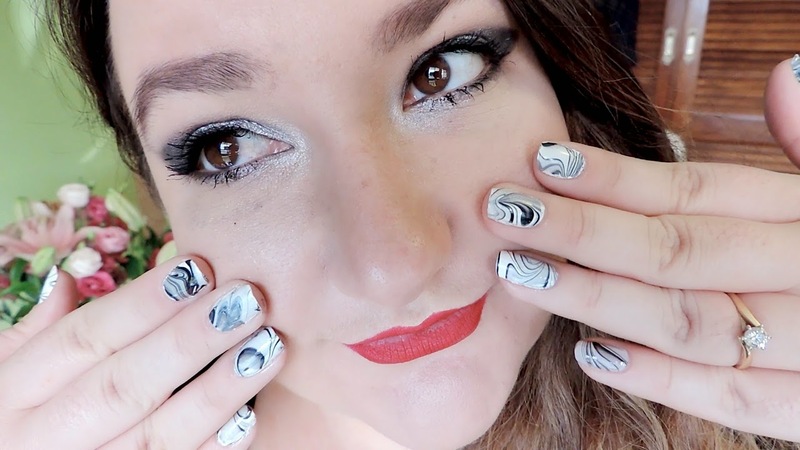 Krystal @ Little Beauty Bug | Bloglovin' | Facebook BBloggers Group!